This is not the first time I have talked about the wonderful friends I have made through the blogging world. First it was during the holidays when we threw a virtual party to make up for the miles separating us. Then again last month when so many of my loving and talented friends threw me an incredible virtual baby shower. Now, along with hostess Amy of Sing For Your Supper, we are throwing a virtual bridal shower for my friend Kelsey of Apple a Day. She’s getting married! To a wonderful guy! In less than two weeks!! You’ll have to excuse all the exclamation points but I think this occasion is deserving of excessive emotion :) Kelsey is one of the sweetest, most generous people I know. I could not be more thrilled for her as she embarks on this new chapter in her life. Kelsey is the only one of my close blogging friends that I have had the honor of meeting in real life (so far). We both vacation frequently in Kiawah Island, SC and a couple of years ago our trips overlapped. We had a wonderful time together and I certainly hope our paths cross again soon. When deciding what to contribute to the shower, I thought it would be fun to make something that could be a favor for shower guests. Of course my mind immediately goes to sugar cookies with royal icing, but I decided to try to think of something a bit different from my usual fall back. 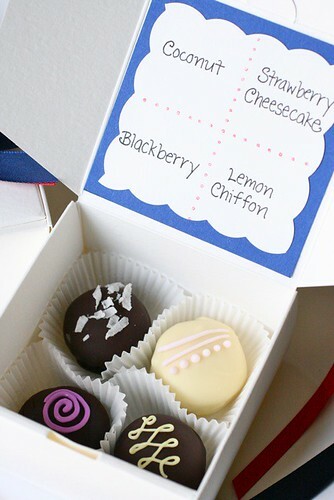 Since she is having a springtime wedding, I thought it would be fitting to do a box of assorted truffles with fresh, fruity flavors. While brainstorming, I came up with a very extensive list and had a hard time narrowing it down, but finally settled on these four: coconut, strawberry cheesecake, blackberry and lemon chiffon. 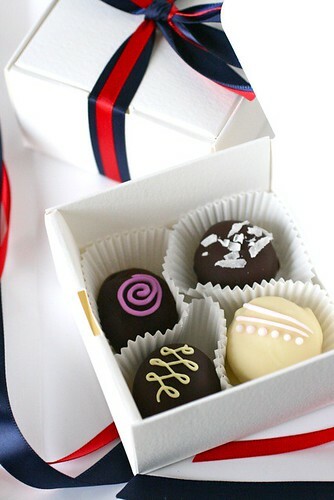 Truffles are an elegant favor for any occasion, but also very convenient since they can be made in advance. 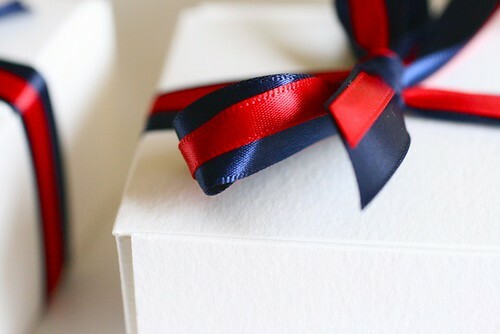 When packaged up with some pretty ribbon, in this case coordinating with the wedding colors, they make a nice gift for party guests. It is certainly optional, but I think it is a nice touch to include a flavor guide within the box so people know exactly what they are eating. I’m always hesitant when eating assorted chocolates for fear of biting into something mint, but when I have a guide it’s all good. Normally I would have typed and printed these, but I was crunched for time so I just did it by hand this time. In the interest of keeping this post from being a mile long, I’ll be sharing the recipes for these truffles over the next few weeks. I definitely spent a lot of time (and major frustration) testing to get the flavors and textures exactly right, but the final results were wonderful and worth it. Unfortunately the strawberry cheesecake truffle is still going to take a little more work. The flavor was spot-on but they were extremely difficult to work with. I’m not giving up though, these are definitely too good to forget. I’ll share that recipe when it is more reliable. 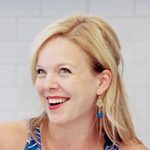 Be sure to check out the round-up posts on Kelsey and Amy‘s blogs so you can see the full spread of our virtual shower, as well as get the links to all the participants’ blogs with their contributions and recipes. Congratulations Kelsey! I am so very happy for you. Resources: These favor boxes came from Paper Source. I’m so addicted to this store.